Blueberry, Fresh Free Blog Templates. Blueberries are flowering plants of the genus Vaccinium with dark-blue, -purple or black berries. Species in the section Cyanococcus are the most common fruits sold as "blueberries" and are mainly native to North America. Blueberries may be cultivated, or they may be picked from semi-wild or wild bushes. In North America, the most common cultivated species is V. corymbosum, the Northern highbush blueberry. Hybrids of this with other Vaccinium species adapted to southern U.S. climates are known collectively as Southern highbush blueberries. So-called "wild" (lowbush) blueberries, smaller than cultivated highbush ones, are prized for their intense color. The lowbush blueberry, V. angustifolium, is found from the Atlantic provinces westward to Quebec and southward to Michigan and West Virginia. In some areas, it produces natural blueberry barrens, where it is the dominant species covering large areas. Several First Nations communities in Ontario are involved in harvesting wild blueberries. Lowbush species are fire-tolerant and blueberry production often increases following a forest fire as the plants regenerate rapidly and benefit from removal of competing vegetation. Wild has been adopted as a marketing term for harvests of managed native stands of low-bush blueberries. The bushes are not planted or genetically manipulated, but they are pruned or burned over every two years, and pests are "managed". There are numerous highbush cultivars of blueberries, each of which have a unique and diverse flavor. The most important blueberry breeding program has been the USDA-ARS breeding program based at Beltsville, Maryland, and Chatsworth, New Jersey. This program began when Frederick Coville of the USDA-ARS collaborated with Elizabeth Coleman White of New Jersey. In the early part of the 20th Century, White offered wild pickers cash for large-fruited blueberry plants. Rubel, one such wild blueberry cultivar, is the origin of many of the current hybrid cultivars. Rabbiteye Blueberry (V. virgatum, syn. V. ashei) is a southern type of blueberry produced from the Carolinas to the Gulf Coast states. Other important species in North America include V. pallidum, the Hillside or Dryland Blueberry. It is native to the eastern U.S., and common in the Appalachians and the Piedmont of the Southeast. Sparkleberry, V. arboreum, is a common wild species on sandy soils in the southeastern U.S. Its fruits are important to wildlife, and the flowers important to beekeepers. Blueberries are flowering plants of the genus Vaccinium with dark-blue, -purple or black berries. Species in the section Cyanococcus are the most common fruits sold as "blueberries" and are mainly native to North America. They are usually erect but sometimes prostrate shrubs varying in size from 10 cm tall to 4 m tall. In commercial blueberry production, smaller species are known as "lowbush blueberries" (synonymous with "wild"), and the larger species as "highbush blueberries". The leaves can be either deciduous or evergreen, ovate to lanceolate, and from 1–8 cm long and 0.5–3.5 cm broad. The flowers are bell-shaped, white, pale pink or red, sometimes tinged greenish. The fruit is a false berry 5–16 mm diameter with a flared crown at the end; they are pale greenish at first, then reddish-purple, and finally blue on ripening. They have a sweet taste when mature, with variable acidity. 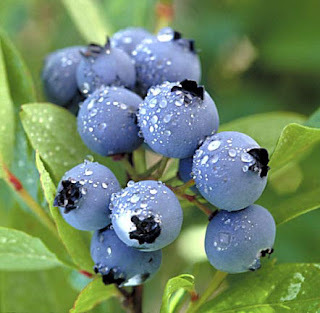 Blueberry bushes typically bear fruit from May through June though fruiting times are affected by local conditions such as altitude and latitude.